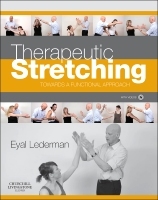 Welcome to the companion website for Therapeutic Stretching: Towards a Functional Approach, by Eyal Lederman DO, PhD. This site hosts a range of videos supporting the text - Therapeutic Stretching: Towards a Functional Approach. The Publishers have used this website for posting instructive video sequences related to some of the techniques described in the book. These videos include demonstrations and educational sequences of specific manual therapies and readers are invited to access these videos early on during their orientation through the volume.